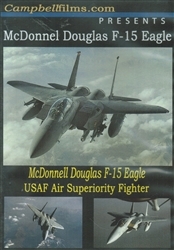 The McDonnell Douglas F-15 Eagle DVD is a collection of vintage films on McDonnell/Douglas F-15 Eagle. The 1st designed Air Superiority Fighter since the F-86 Sabre used in the Korean War and explains the reason why the F-15 was developed. We hope you'll enjoy! Film #1 - F-15 Eagle Development - The war in Vietnam made our Air Force re-think its fighter aircraft design. It became clear there was a need for an aircraft that was an air superiority fighter vs. an all purpose aircraft. From development to the F-15 in flight, this film explains that story. Runtime is about 13 minutes. Film #2 - F-15 Eagle - Three short films explaining the flight characteristic of the F-15 and aerial footage of the F-15 Eagle. The F-15 was the 1st aircraft that could climb straight up in supersonic flight. Runtime is about 10 minutes. Film #3 - Red Flag Training - A Top Gun USAF film about training the F-15 Pilots on how to fight against different types of enemy aircraft somewhere over the Nevada Desert and win. Runtime is about 11 minutes. Film #4 - From Vietnam to Now - The lessons learned in Vietnam created a new type of thinking. Advances in fuel, transports, new aircraft like the F-15 Strike Eagle and the F-16 Falcon, plus the USAF members were all examined. Runtime is about 9 minutes. Film #5 - Refueling the F-15 - To carry out its missions, the F-15 needed to be refueled in flight. A great short story and footage of the KC-10 and the KC-135 refueling the F-15. Runtime is about 9 minutes. Film #7 - Fastest Man Alive - In 1947, Major Chuck Yeager broke the sound barrier in the Bell X-1. He was nicknamed "The Fastest Man Alive". 65 years later, at the age of 89, General Chuck Yeager reenacts this historic flight in a F-15E Strike Eagle over the skies of Nevada. Great piece of history of the General and the F-15 Eagle. Runtime is about 8 minutes. Total runtime for the McDonnell Douglas F-15 Eagle DVD is about 78 minutes. Format is NTSC DVD and region-free.